The Environmental Protection Agency (EPA) reports that the average American family of four uses about 400 gallons of water a day. The agency says that by switching to more efficient appliances and fixtures, we can cut our water use by 30 percent. Being water wise takes more than just machinery, however. A little care and common sense go a long way toward minimizing waste of this increasingly precious commodity. Here are 11 tips for reducing water consumption at home. Not only will your water bills go down, but every drop you save will help ensure that our taps will never run dry. Start saving by breaking a bad habit: Never let faucet water run needlessly as you wash or rinse dishes, wash your hands or face, brush your teeth or shave. Bathroom faucets run at about 2 gallons of water a minute, according to the EPA. Turn off the tap while you brush your teeth and shave, and you can save hundreds of gallons a month. Tip: Be sure to fix leaks. A slow drip from a leaking faucet can waste as much as 20 gallons of water a day. A leaky toilet can waste 200 gallons a day. Learn to repurpose water. One easy way is to capture under your colander the potable water you use to rinse fruits and veggies, and deposit it in the garden. Do the same while you wait for your hot water to come in. Take a page from the past and make smart use of dual sinks. Instead of letting the water run while you wash dishes, fill one sink with hot, soapy water for washing, and the other with cool, clear water for rinsing. You’ll use half the water you otherwise would, according to the EPA. If your sink is a single model, use two large bowls for washing and rinsing. 4. Consider a smaller dishwasher. Today’s modern, efficient dishwashers can save a great deal of water. Scrape dishes instead of rinsing them before loading, and you’ll save up to 10 gallons a load. You should run only full loads. If you generally have small loads to wash, consider buying a double-drawer model, such as the Fisher Paykel one shown here. The drawers, which use less than 2 gallons of water each, work independently, saving water, energy and detergent. 5. Buy a high-efficiency washer. The average American family washes about 300 loads of laundry each year. Clothes washing accounts for more than 20 percent of residential indoor water use. As a rule, front-loading machines use less water than top-loading machines. But whether you’re shopping for a front- or top-loading washer, to save the most water, look for an Energy Star–certified machine. These machines use about 40 percent less water than regular washers. The key to their savings is that the tub does not get filled up; clothing is flipped and spun through streams of water and repeated high-pressure sprayings. 6. Go with low-flow and shorten your showers. The bathroom is the site of the greatest indoor water use in the house. So it’s also a place where you can reap major water savings with some smart choices. Toilets, for example, account for nearly 30 percent of an average home’s indoor water consumption. Older toilets use as much as 6 gallons per flush. But the newer, EPA WaterSense-certified toilets use just 1.28 to 1.6 gallons of water per flush. Dual-flush toilets use even less water. Showering accounts for almost 17 percent of household indoor water use — 40 gallons a day for the average family of four. To save water here, replace a regular showerhead, which uses 2½ gallons a minute, with a WaterSense-certified showerhead, which uses 2 gallons a minute or less while offering the same or better shower performance. 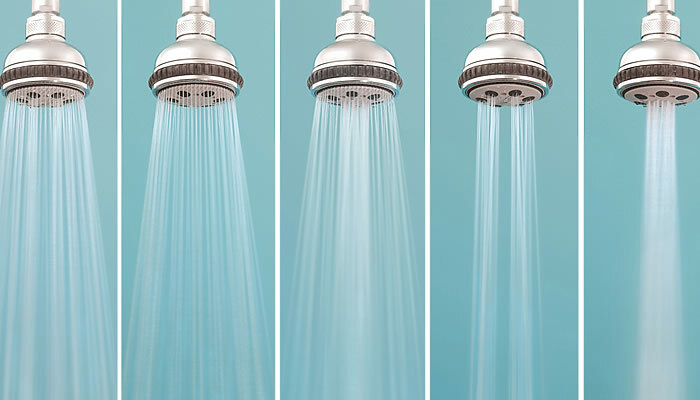 You can save up to 150 gallons of water each month by shortening your shower by one to two minutes. Use a kitchen timer to time your showers. Aim for five minutes or less. Pool covers can be a pool owner’s best friend. Not only does a cover retain a heated pool’s temperature, but it reduces evaporation. The Department of Energy reports that a pool cover cuts the amount of replacement water needed by 30 to 50 percent. Consider hand watering if you have a small garden area. Households that manually water with a hose typically use 33 percent less water outdoors than those that use an automatic irrigation system, according to the EPA. 9. Get smart about irrigation. Find ways to save and store rainwater for use in the garden. Using a 55-gallon drum like this one, which catches roof water from gutters and downspouts, is one easy way. Remember to cover your barrels to keep mosquitoes at bay. Tell us: Has your household been cutting back on water? Share your experiences and tips in the Comments section below.